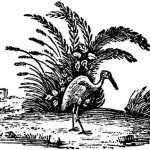 A collection of over 4,005 free downloadable public domain images for crafters and web designers that have been rescued from old books, magazines, and other print materials. All of the images in this collection are copyright free in the United States and any country that extends copyrights up to 70 years after the death of the original artist making them in the public domain and free to use in your next scrapbook page, notecard or other craft projects. If you have never seen one of these majestic water birds in the wild, you have missed something truly special. Whether a great blue heron or one of the many other species of this tall and stately bird; to see one of these birds trolling the shallows, will be something that you will always remember. This growing collection of vintage illustrations and drawings of herons can give you an idea of how beautiful and majestic these birds are. Add one or more of these copyright free illustrations to your next art or other creative project. 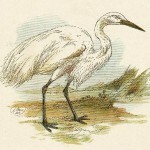 Vintage drawing of a large white bird that the naturalists once called the American egret. Sadly, its lovely tail feathers may have been its downfall. 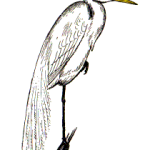 Others might know this stately bird as a great egret, but when I see the birds depicted in this vintage drawing, I always call them white herons. Heron block print from over 220 years ago. Tiny drawing of a heron or crane in flight. 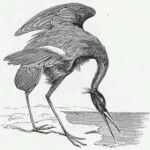 Vintage drawing of an Oriental-style flying heron. 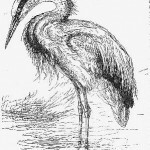 Vintage drawing of a heron patiently waiting to catch a meal. 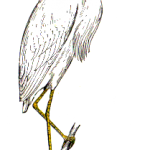 Drawing of a beautiful heron called a snowy egret. 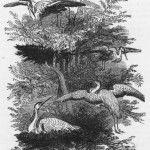 Vintage drawing of a group of herons at their roost. Wonderful, vintage illustration of a heron standing at the shore. 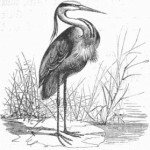 Vintage black and white heron illustration. 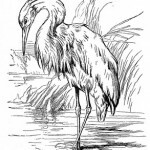 Beautiful line drawing of a wading heron.